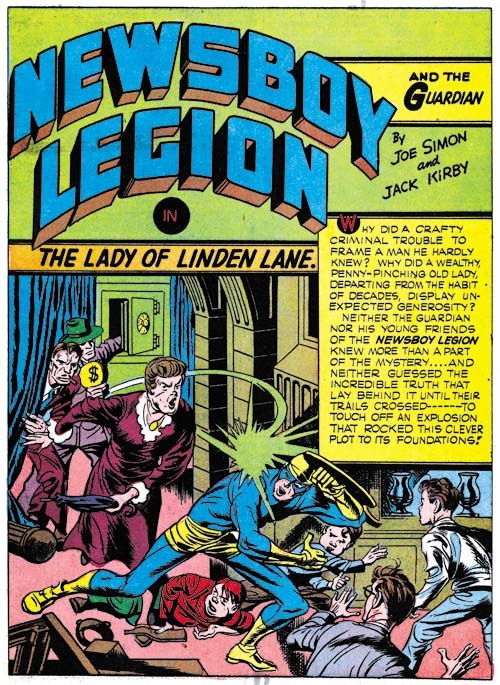 In the previous chapter I covered the artist who did most of the Newsboy Legion stories while Joe Simon and Jack Kirby were off doing their military service. I had questionably attributed this work to Arturo or Louis Caseneuve based on comments made by Joe Simon. 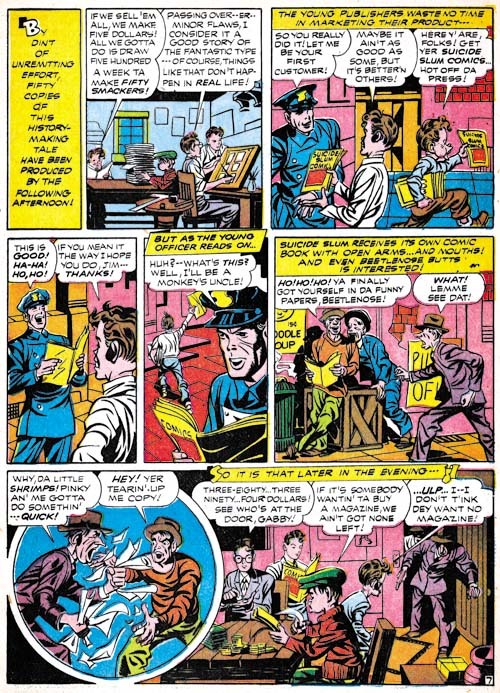 However I have now seen enough work attributed to these artists to doubt that they had anything to do with penciling all those Newsboy Legion stories. I also looked into a commenter’s suggestion that the artist might be Phil Bard and although I will completely rule that out I do not believe it is a correct attribution either. 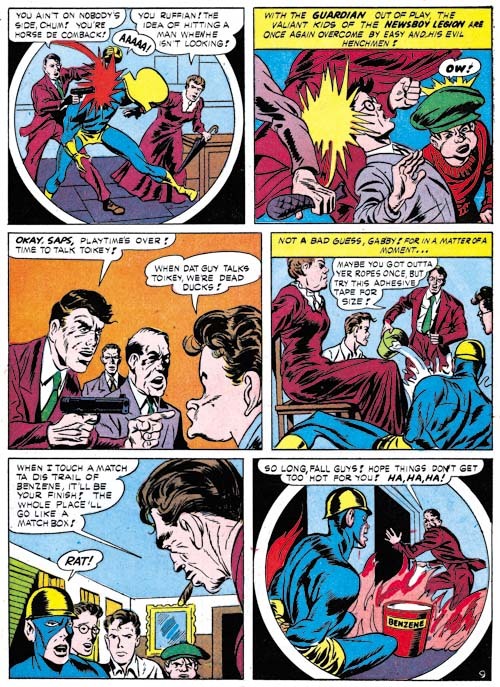 All I can say is that I am certain this artist was not Gil Kane. 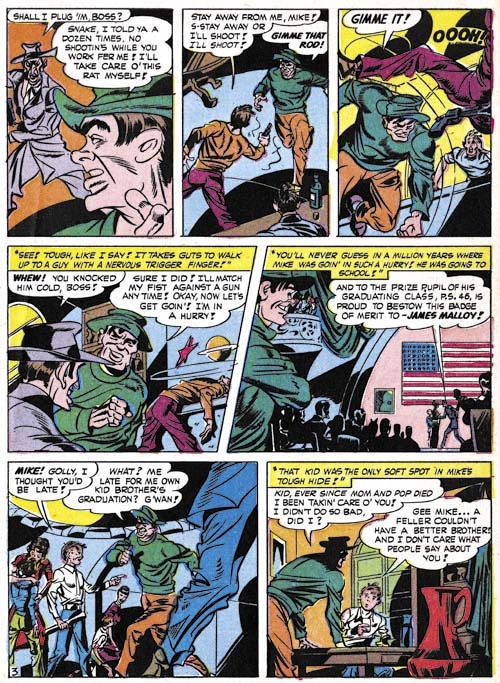 Whoever the replacement artist was his Newsboy run ended with Star Spangled #49 (October 1945). It was not Simon and Kirby that followed the replacement artist but yet another artist that I am unable to identify. 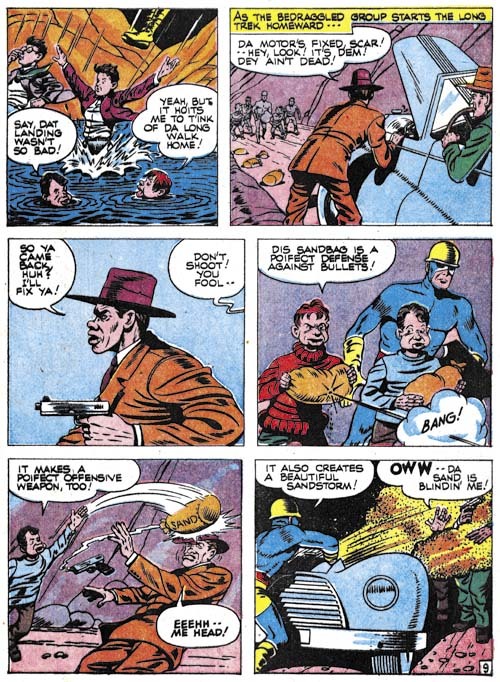 Unfortunately he is not up to the standards of the S&K replacement artist let alone the real Simon and Kirby. 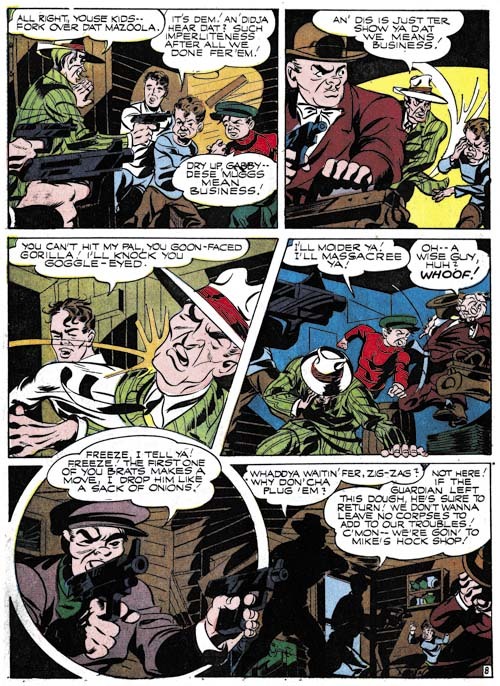 Panel 2 of page 11 (see above) and the cover for KO #1 (October 1945) clearly share some sort of connection. The cover dates for the SS #50 and KO #1 are so close that is hard to believe one was swiped from the other unless that happened before publication. 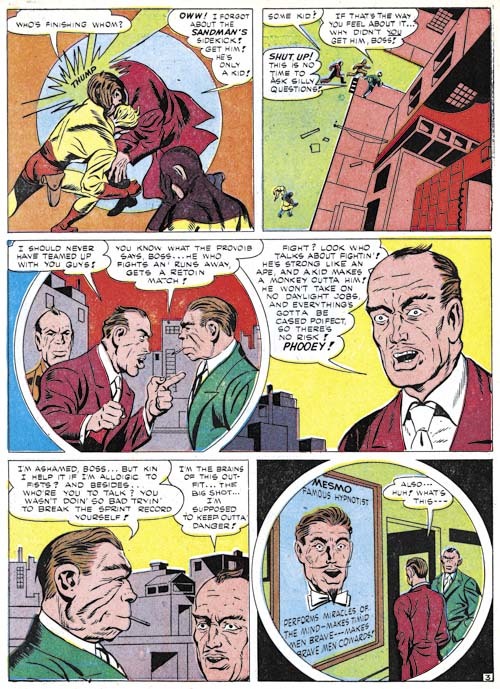 Perhaps there is an older Simon and Kirby work that both were based upon that has not yet been recognized. 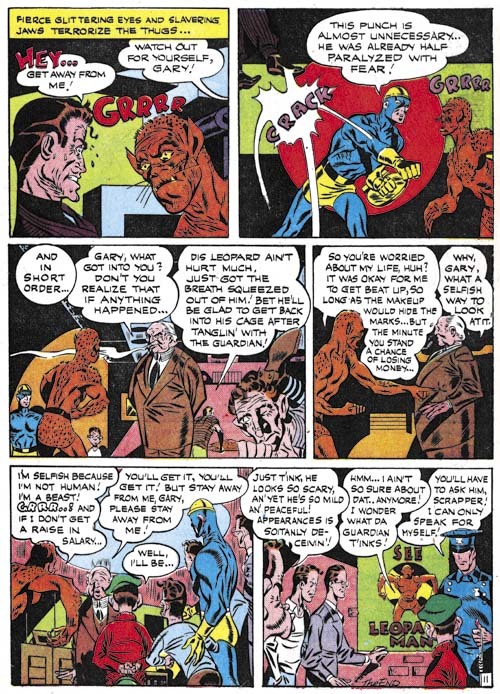 Oddly while no one seems to have credited “The Leopard Man Changes His Spots” as a work by Simon and Kirby some have attributed the KO #1 cover to Kirby. However there are so many things wrong with the KO #1 cover that a Kirby attribution can certainly be rejected (see Not Kirby: KO #1, KO #1 Returns and KO #1, Round Three). The covers for Star Spangled #44 (May 1945) to #47 (August 1945) were drawn by the replacement artist that I covered in my last chapter (Chapter 2, The Replacement). Jack Kirby drew the covers for Star Spangled #48 (September 1945) to #51 (December 1945) but the question is when were these done? 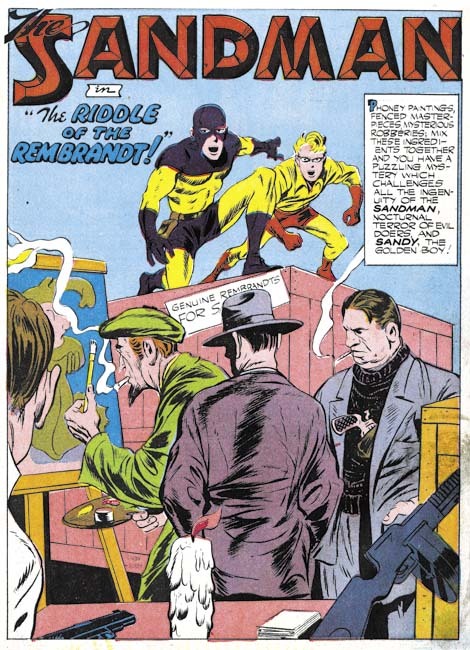 Were they part of the inventory that Simon and Kirby created before they entered military service? Or were they done after Jack returned from Europe? Kirby could have drawn them even if he had not yet left the service. 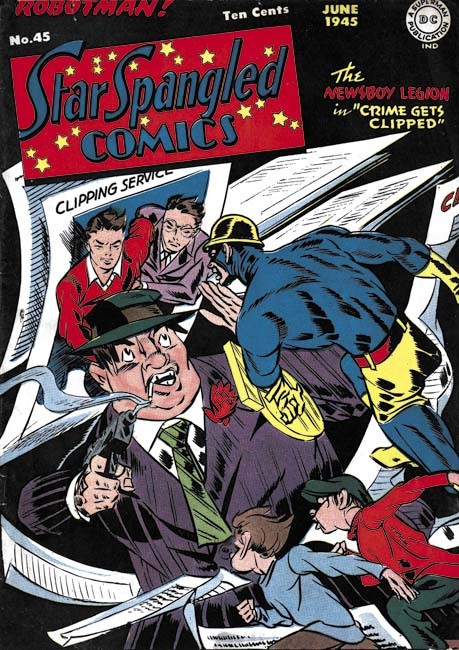 I am not going to try to answer that question at this time but I am certain that the cover for Star Spangled #52 (January 1946) was not part of the original inventory. Kirby not only penciled this cover he inked it as well. Such inking was a luxury that Kirby could not afford while busily building up the original inventory. So from this point on it can confidently be said that Kirby was back. It has a Simon and Kirby signature but I do not think Joe was out of the military yet. This was just Jack recognizing his partnership with Simon. 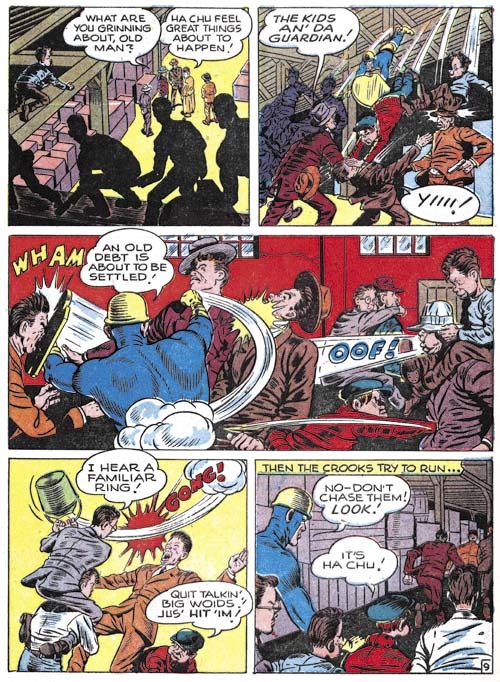 Joe had done the same thing earlier on the cover for Boy Commandos #12 (Fall 1945) done while Joe was in the Coast Guards and Jack was still in Europe. To my eyes this cover has a more advanced appearance compared to earlier covers. 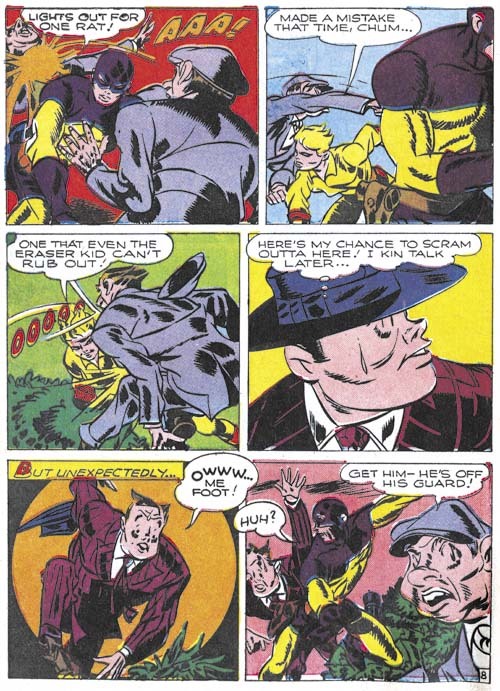 Much more like what would be seen in Stuntman; the first issue of which would appear a few months later. 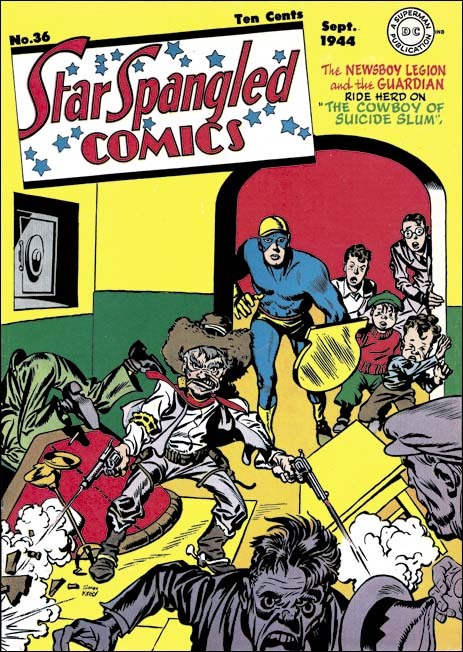 Even later Star Spangled covers were not quite as advanced probably because Jack did not ink them as well. 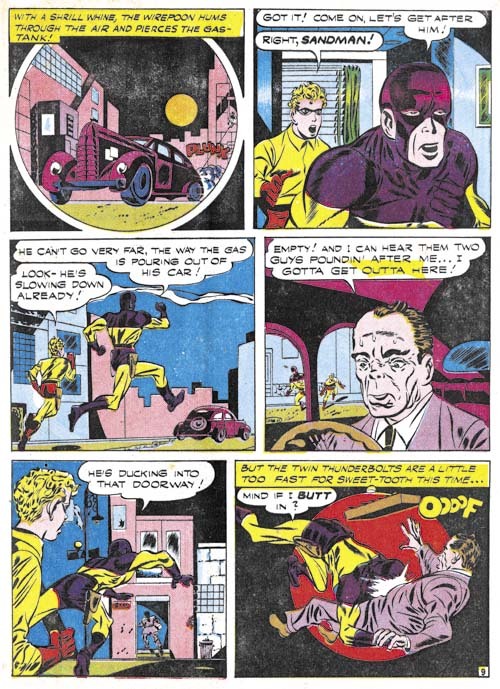 Star Spangled #52 (January 1946) “Rehearsal for Crime” page 5, art by Gil Kane? 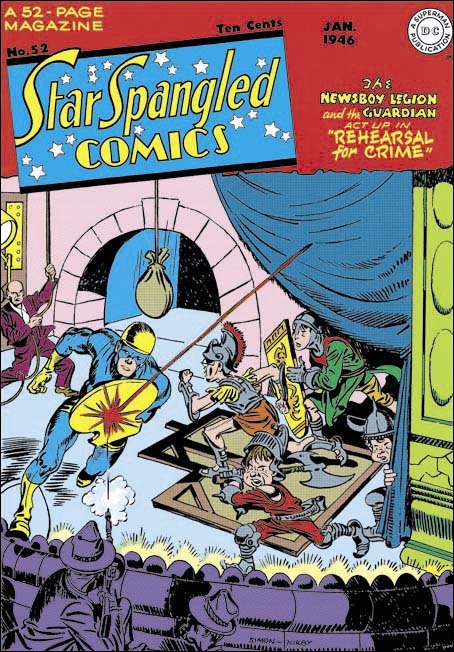 Jack Kirby did the cover for Star Spangled #52 but he did not draw the “Rehearsal for Crime” story that appeared inside. 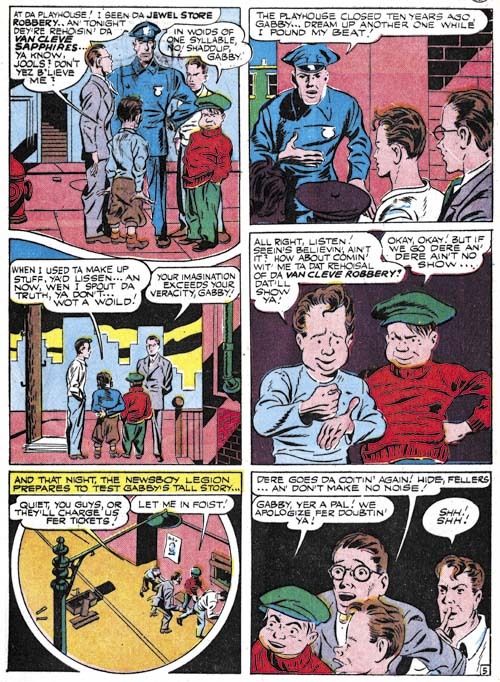 Nor was this the artist who did art found in issues #50 and #51. 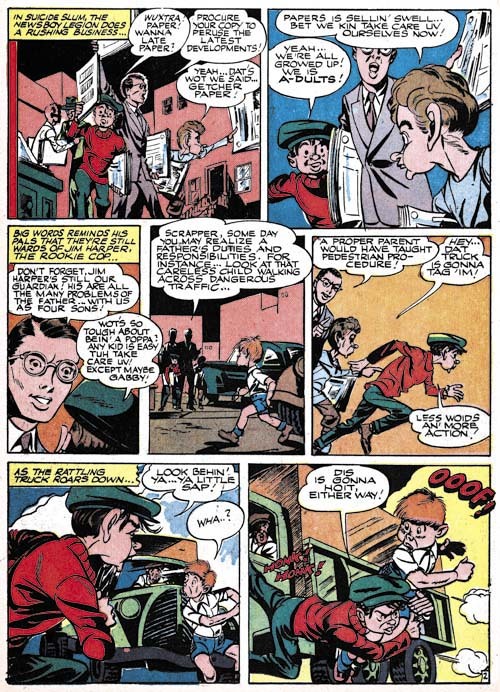 The artist’s work reminds me a lot of the earlier work that Gil Kane did for the story in issue #30 (Chapter 1, The Newsboy Legion). 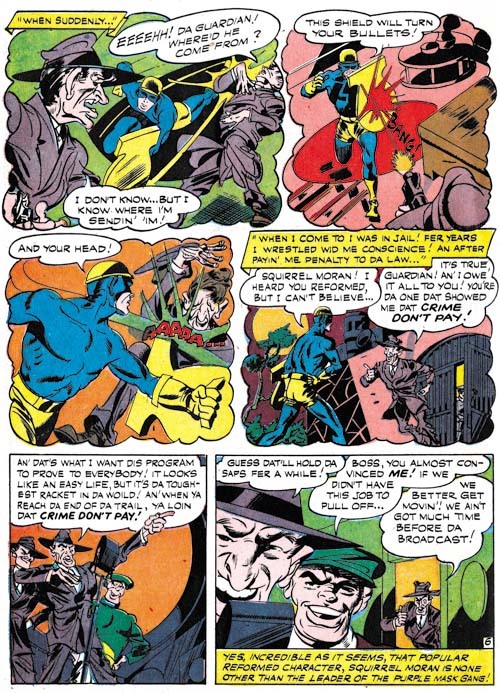 Page 5 of “Rehearsal for Crime” was not the best page for showing that Gil Kane probably drew this story but I could not resist using it because of the fourth panel. 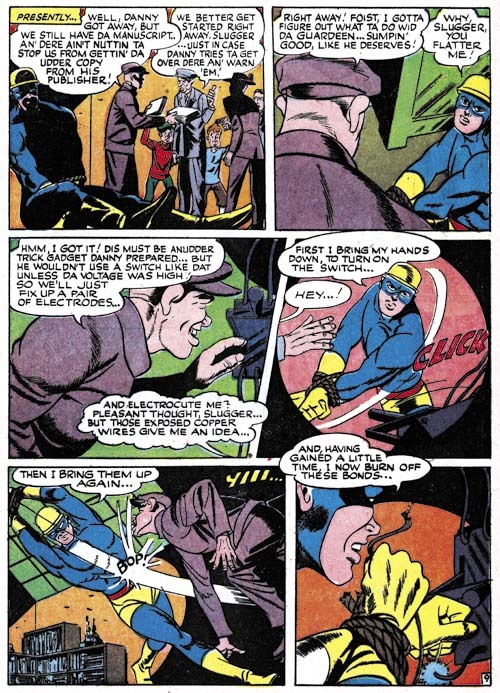 It is a swipe that ultimately is derived from Simon and Kirby art from Star Spangled #8 (May 1942). 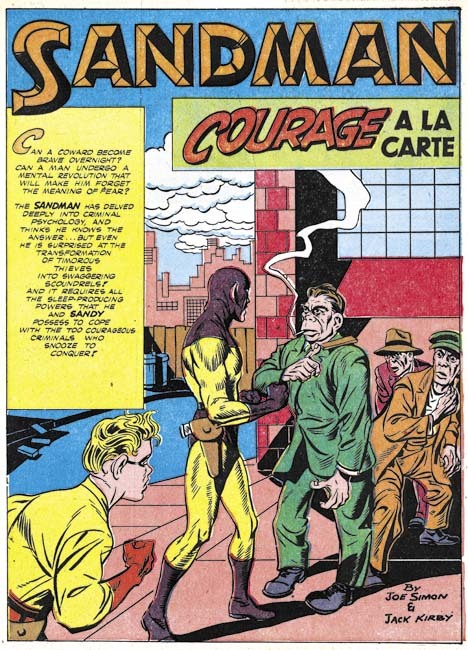 But that was not the version that was actually swiped, it was the one Kane did for Star Spangled #30 (March 1944). Only now the figures of Gabby and Scrapper have been switched. 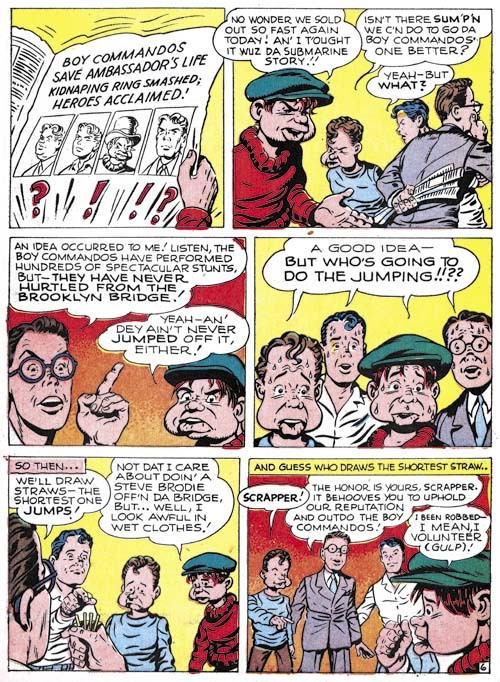 Jack Kirby would draw the stories for issues #53 to #59 (February to August 1946) and the covers up to Star Spangled #61 (October 1946) and that would end Simon and Kirby’s involvement in their Newsboy Legion. I doubt that Simon and Kirby every just walked away from work so I believe this was DC’s decision. Stuntman #1 is cover dated April so that timing is just right to suggest that Simon and Kirby were dropped because they had jumped ship to a competitor (Harvey Comics). While this might have been true I would not read too much into it because Joe and Jack continued to provide work for Boy Commandos for years to come. 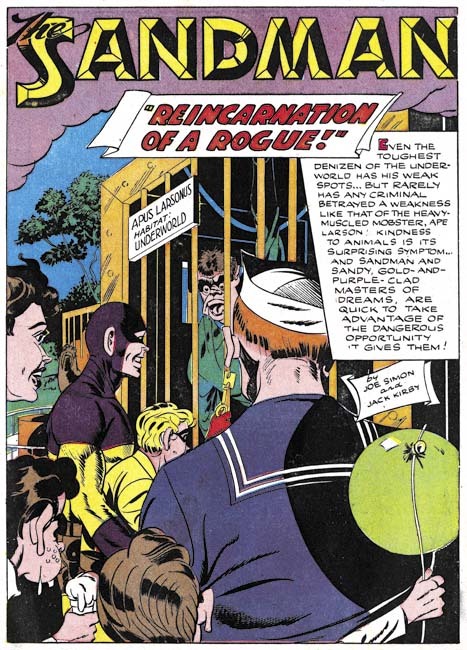 Without question DC was pretty mad about what Joe and Jack had done but just not mad enough to sabotage a popular title like Boy Commandos. Simon and Kirby’s replacements would still strive to look like they were done by the masters but unfortunately these imitators were just not that successful. 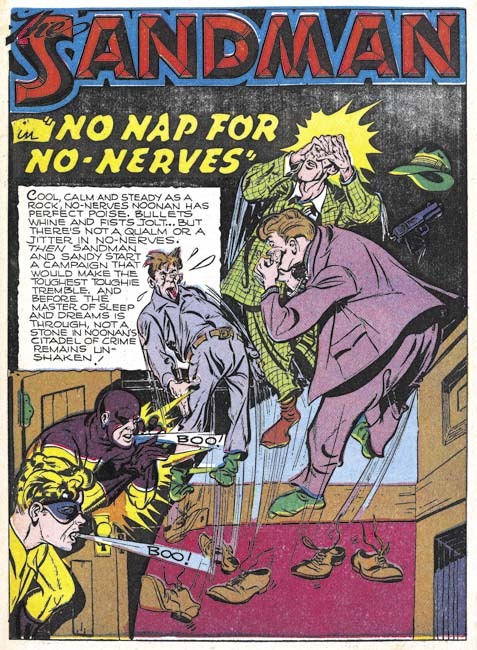 It seems that each issue had a different artist with perhaps the penciler for “Steve Brodie the 2nd” being the best. 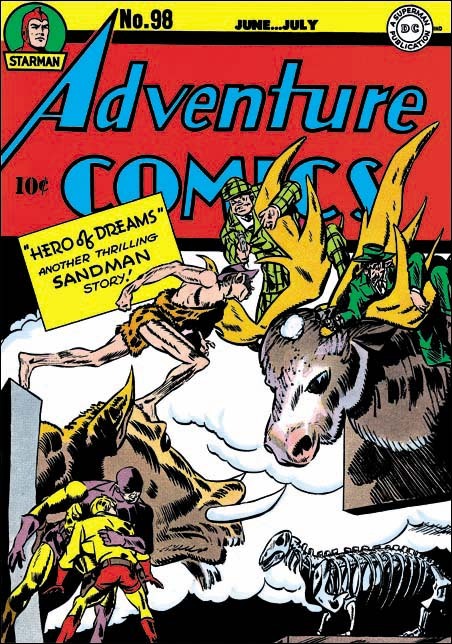 I do not know, could there have been any purchasers who bought this comic with a Simon and Kirby cover who were not disappointed by the story inside? 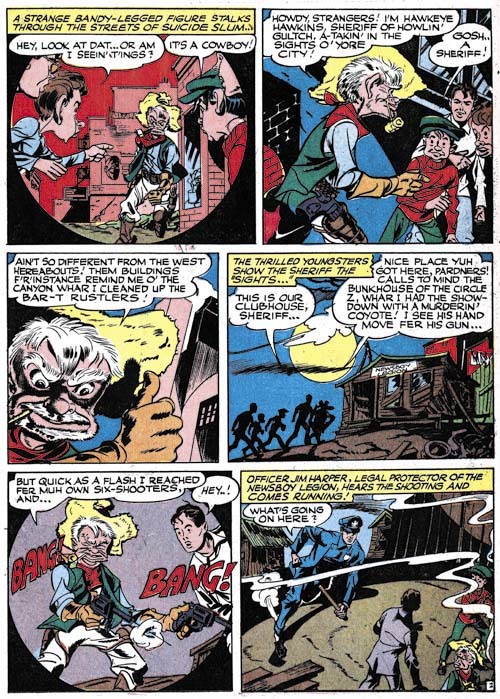 I provide another example a Newsboy Legion artist from after Simon and Kirby had left a second time. Perhaps the reader can sense that my heart just is not into this work. It is not these artists are really that bad but coming after Simon and Kirby it is a bit of a let down. They did not even have the interesting and original qualities of the main replacement artist from the war years. 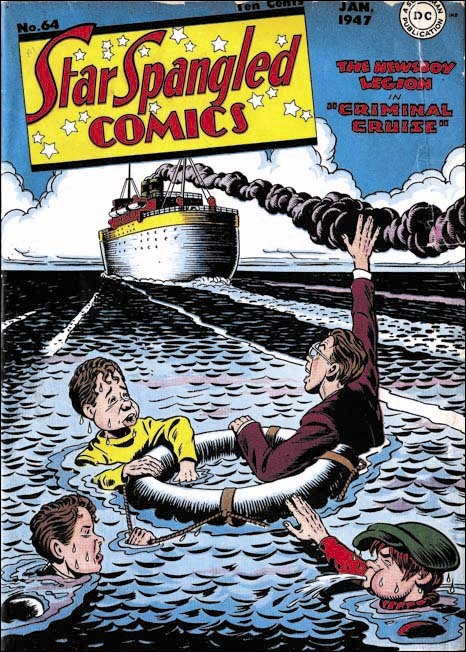 The cover for Star Spangled #64 (January 1947) shows a boat leaving the Newsboy Legion behind. 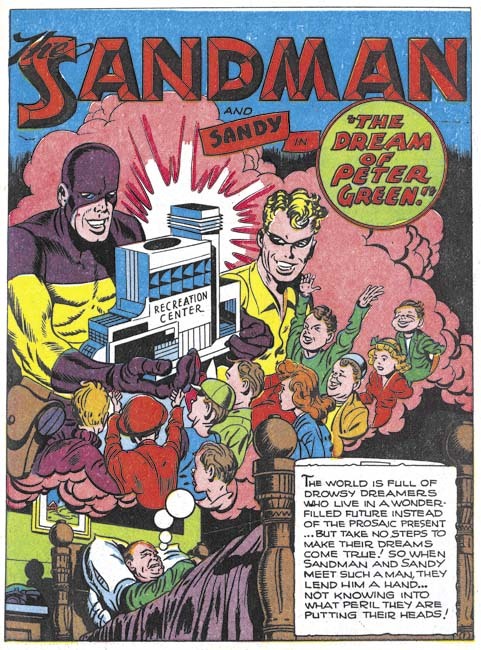 Somehow it seems a fitting metaphor for the last issue of the Star Spangled that contained the Newsboy Legion. The next issue would feature Robin on the cover. Still the run lasted from April 1942 to January 1947. At 56 issues that is not bad at all. 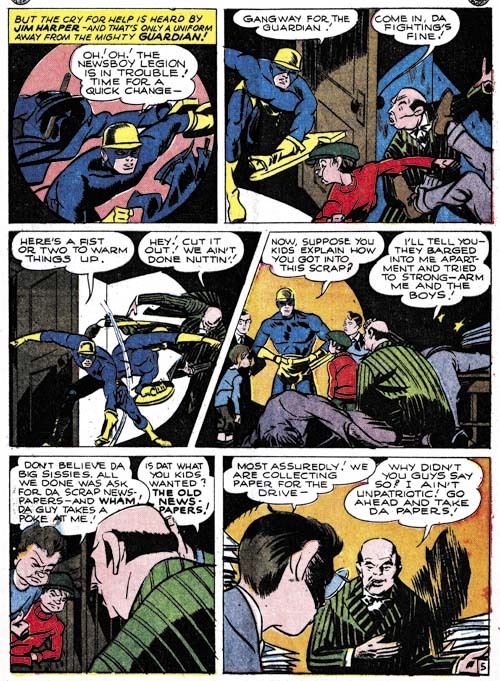 The demise of the Newsboy Legion seems to be part of DC’s decision to move away from the multitude of golden age features and concentrate on what they considered their core characters, Superman and Batman.